I'm currently working towards a career in advertising. Some of the things I hope to demonstrate through this blog include: my social media abilities, my ability to write, the ability to think strategically, the ability to think creativity and my knowledge of the advertising industry. 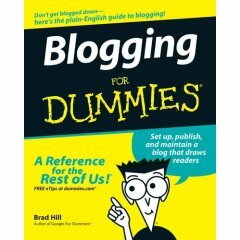 Rule #1 to Blogging Success: Never stop blogging. To the fans I earned off the strength of this site, I'm sorry. It's been way too long since I've updated. While I know it's too late to win you back, and I'm not sure I'm in a place where I want to put as much effort into this site as I used to, I still wanted to at least explain where I've been since I supposedly fell off the face of the Earth. This site was meant to act as a quasi-portfolio for me. As a student coming out of school, I felt like I needed something to demonstrate my understanding of the business and my ability to succeed. Ultimately, it worked. When interview time came at 58Ninety, this was one of the resources they used to judge me and it worked in my favour. I've been with 58Ninety since April 2010. In the last year-and-a-half, I've grown tremendously as an interactive advertising industry professional. I was promoted to Client Engagement Manager a few months ago, and along the way I've had a chance to refine my skills in account management, project management, new business development, content entry, information architecture and most recently, strategic planning. I've also been fortunate enough to work with an amazing team that have helped me grow and made the experience enjoyable. I hope that I'm leaving as positive an impact on the rest of the team as they have on me. I'm forever thankful to 58Ninety for the opportunity they've given me and I'll continue to do my best to get better to the benefit of everyone around. With that said, maintaining this blog fell on the priority list. I'm proving my worth every day with the work I contribute to 58Ninety and the experience I gain during that process. Those will hold more weight to my overall worth than my writings about "ad campaign X" ever could. Recognizing the opportunity at hand, I put in the extra effort to building on that success, which has paid off so far. What was once a pet project that got 100 visits a month if I was lucky has grown to a site that serves thousands of monthly visitors. Though it may not tie into interactive advertising in terms of subject matter, you could make a strong case for In Third Person being a stronger 'portfolio piece' than this site ever was. It's still hard for me to believe that the site gets that many eyes on it and that I've gained loyal fans around the world who care about my perspective on video games. The best part of this experience is that In Third Person has never felt like work. I was doing this for for fun a year before this success, and I would have continued writing for it regardless of the outcome. As long as it's still fun, I'll keep regularly updating it. Much of my adult life to-date has been spent working assorted part-time jobs to pay the bills. I've worked a ton of nights and weekends making close to minimum wage, and because of that, I had to make sacrifices to other parts of my life. I understood that these were the steps I needed to take to get to the next level, but they're tough steps to take. Now that I'm working a mostly 9-5 gig, that opens up things that many people take for granted, such as evenings, weekends and holidays. There's a life outside of work, too, and now I have more opportunities to enjoy that. The most exciting thing lined up for is a trip to England with my girlfriend Steff. I've never really had the opportunity in my life to travel for the sake of traveling up until now, so this trip is going to be special for all sorts of reasons. That's where I'm at. Life is good, and I'm hoping life is going well for you, too. Thank you for still checking this page out after all of this time. I'm still not sure where to take this site from here, but I'll at least check in more than once a year. If you'd like to follow my more frequent works, check out In Third Person. When I started In Third Person, I never anticipated it being nothing more than my personal place to write about video games. If people outside of myself enjoyed it, I would consider a bonus. Today, a lot of people enjoyed it. 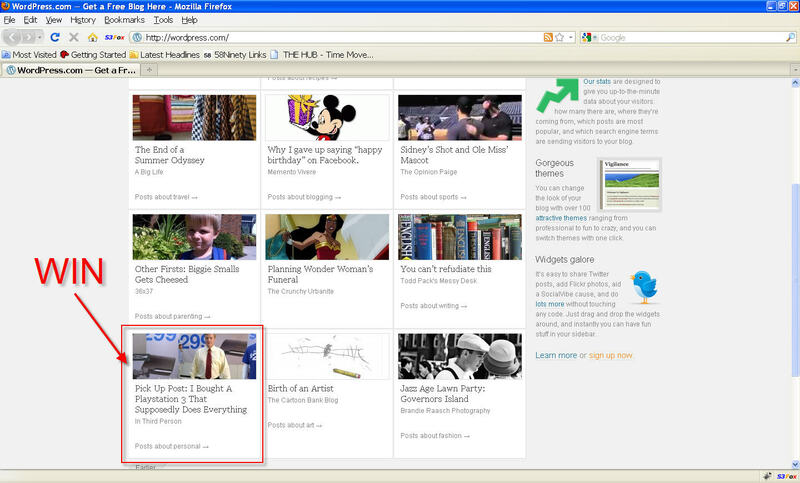 First, the team at Wordpress, who chose to feature my blog on the Wordpress.com home page. Then, the many people who followed through. My site at most normally gets a few dozen visits a day, but today I broke 1,000 and got a lot of great discussion in the comments. I'm honoured to have my work featured on the Wordpress home page. It says a lot about the quality of my work and I hope that those who found my blog through Wordpress will continue to read my posts and comment on them. Here's to hoping the success continues. Just over a year ago, I started jettlandicho.com with the intention of it being my professional presence on the Internet. I planned to create content that I would be proud to show advertising industry professionals, advertising students, my mom or anyone that happened to Google my name. In an era where every employer will use the Internet to know everything there is to know about prospective hires, I wanted to make everything they found awesome. Outside of that joke Amazon.com review written in my name (thanks, Ahmed), I think I have done a decent job of taking control of the 'Jett Landicho brand'. While I think points one and two still stand, I think there are some positives to be had from claiming this other site as mine. Should you be interested in my personal project and the rationale for 'outing' it, read the rest of this post. In Third Person is a video game blog. I may not have the credentials of IGN, Gamespot or Ice-T, but it's the only place to get video game thoughts and opinions from yours truly. I try and write everything as personable and relatable as possible so that I can provide you with a compelling third person perspective on everything relating to video games. If you value what I have to say about games, awesome. If you don't, you're more than welcome to disagree with me in the comments. I love video games. I've been actively playing games for over 20 years. I've been actively following the scene and the culture since the early days of Electronic Gaming Monthly. There are a lot of thoughts and experiences I've always wanted to share but never had the outlet to express myself. This may sound cheesy, but I think having this outlet has been good for my soul. This project was birthed out of my love for video games and I hope it comes through in my work. Most of the jettlandicho.com traffic comes from potential employers looking for background information on me and from advertising students who know me through Seneca College's Creative Advertising program. Odds are, if you're in the first audience, you probably don't care about video games. I understand that. What might be relevant to you is that In Third Person is another example of my ability to work with blogs and, in particular, the Wordpress platform. I'm still fine-tuning the blog to get the right template and plug-ins, but I know how to use it and I use this all the time. Feel free to judge me based on my ability express thoughts and ideas through interactive and social technologies. I am also putting this out there as another means for someone to learn more about me as a person. jettlandicho.com was partially made to compensate for my lack of interactive advertising experience and my lack of a professional presence on the web. A year later, I'm fortunate to have a number of interactive and social media projects under my belt. When the time comes, I can always speak to that experience and to this blog. Throughout this past year of working in advertising, I've also learned about the value in personality. Opportunities can be made or lost based my personality and how I would mesh with others. While who I am is framed mainly within the context of video games, I think a lot about who I am as a person shines through. 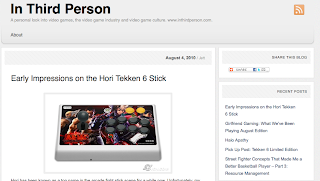 In Third Person is my gaming blog that is independent of the work I do on jettlandicho.com. I'm just as proud of the content on In Third Person as I am of the content here. If you enjoy video games or just want to learn a bit more about me, head over there right now. Earlier today, I saw a bunch of internship-related questions pop up on my Twitter from my former professor and "Big Daddy CABBIE", Anthony Kalamut a.k.a. @southsideadguy. He's put out a bunch of questions for the Internet at large to answer so that he can relay that information back to his advertising students, who are all required to complete an internship before graduating. I know it's scary being in his student's shoes, because I was there just a year ago. I've received a lot of help along my relatively successful journey in the advertising industry so far and I actively try and pay it forward. Answering a few of these questions is the least I can do to help my fellow adlanders score their internships. Jump through the cut to see my answers to Anthony's questions relating to internships. If a company rejects you, would you apply again for their program at a later date? Absolutely. Just because a company says no to you once doesn't mean that they'll say no to you forever. As time passes, circumstances change, people change and people change their minds. If you go for an interview and they don't hire you, I would recommend at least adding the people who interviewed you as contacts on LinkedIn or keeping their email on file. That way, you'll have the ability to ask if there are any new opportunities available or, even better, they'll have the ability to contact you first if another opportunity were to arise. Also, the people considering you the first time around might not even be there the second time you apply, which would leave you with a clean slate. While I wouldn't put all my eggs in one basket and focus all of my efforts into one agency, I wouldn't write off an agency that has said no before, either. What's most important in an internship? Atmosphere/culture, opportunity to be hired, experience or compensation? Experience is key because experience is the biggest indicator of your value. You can also consider your experience as an investment to yourself. Regardless of how your internship ends, that experience will stay with you forever, which you can use to leverage yourself into a paid agency position. Atmosphere and culture I put at #2 because a good working environment is extremely important. If you're going to spend 8 hours a day and 5 days a week, you're going to want to spend that time in a place where you're comfortable and enjoy the people you work with. Having worked in both a large agency and a small agency, I can tell you that the atmosphere is very different in comparison, but I enjoy both for different reasons. Finding an agency where you "fit" in terms of skill-set and in personality will go a long way towards a great internship and possibly bigger things in the future. I ranked opportunity to be hired and compensation at the bottom because there are factors beyond your control at play there. You might be hire-worthy, but if your agency doesn't have the money to keep you on, you're out of luck. Also, most agencies don't pay for interns. If you're holding out for a paid internship, you could be waiting for a long time. What challenges have you faced when trying to acquire an internship? The lack of experience and the "lack" of opportunities. I'll start with experience first. Student work helps, but employers definitely prefer to see real work, even from prospective interns. If you come across any opportunities to do any sort of "real" advertising work that you can put in your portfolio or resume, go for it. One of the other things you can do is find another way to demonstrate what you have to offer. For me, my solution was starting up this blog, which actually did help me get my most recent job. However, every person is different and I'm sure there are countless other ways to sell yourself. There are opportunities for internships everywhere, but as a student who doesn't know where to look, it can be daunting. To overcome that, I often consulted with my teachers who had information on openings and I conducted as many informationals with industry professionals as I could to not only learn more about the industry, but also to build a contact base that could possibly help me out in the future. How did/would you find your internship? My story is actually really weird. I had applied to a bunch of ad agencies and done a few interviews, but nothing had panned out. During my final semester at school, we had an assignment to come up with an advertising pitch for a small business. My girlfriend/partner on the assignment, Stephanie, chose an organic candy company called Pure Fun. During our research, we found the President of the company on Facebook. We sent her a message telling her what we were doing and we sent her a mini brief containing info that we'd gathered so far. The President of Pure Fun loved it so much, she wanted to meet us in person. From there, Stephanie and I polished up our presentation, got a bunch of advice from our teachers, and we pitched the President of the company in a school board room. Before we had even graduated, we had essentially won our own account, which then turned into our internships. There are a lot of ways to go about acquiring an internship other than sending resumes to every agency under the sun. In a time when the economy hit the absolute bottom, Stephanie and I created our own jobs by expanding our horizons and putting in the extra effort. Other advertising students have the capability to do the same thing, if not bigger. Would you consider relocating to a different city for an internship? If the circumstances line up in your favour, yes. During my radio career, I did my internship in a city I'd never been to at a station that played country music, a genre I knew nothing about. Through that experience of being in a totally new environment, I learned a lot about radio, the world and myself. There have been a few opportunities for me to do my internship outside of the country through school, but there were other life factors involved that prevented me from going. If I were a student again and all the stars aligned for me to take that step, I totally would. At what age, if any, are you “too old” to be an intern? If you can prove that you have the ability to handle the work of an intern, I don't think you can be "too old". There are people in every industry that are entering their respective fields at different ages because they decided to change their career path or what have you. If you're happy with what you're doing, then your age shouldn't matter. Much respect to Anthony for putting in the effort of getting this type of feedback for his students. His students are really lucky to have a professor like him who is willing to go the extra mile like this. I'm still very much a student of advertising myself with a lot more to learn, but if my answers help even one adlander find their way, then this was totally worth it. Do I need to invest in a "tweener" machine that doesn't really beat out the other two devices I own? Probably not. I've had a few days to play around with it. While I'm definitely not one to say whether or not its going to revolutionize computers, I do have enough experience with it to at least tell you what's awesome/not so hot about it. Hit the link for my impressions of the hottest thing in tech. First things first: I think the iPad at its core is a giant iPod Touch. I've already caught some flack from a few of my iPad-owning compatriots, but it's hard not to draw the similarities. They function pretty much the exact same way, with size being the only major difference between the two. If you've used an iPod Touch before, for the most part, you know what you're getting. With that said, size really does make a difference. It's big enough to make most iPhone and iPad applications a lot easier to use but still notably smaller than a netbook. It's oddly neat to be able to carry what is roughly a very thin book to the couch and do a lot of computer-type stuff on a tablet. I don't think it'll outright replace laptops or netbooks, but it's really neat on the go or if you just want something small to consume digital media with. I play a ton of games on my iDevices, and having the extra real estate made a big difference in playing certain games like Monopoly and The Price is Right. Thanks to the big screen, it's easier for multiple people to look at the screen at the same time, which makes it a much better communal experience. Surfing the web also benefits greatly on the iPad. I hate surfing the web on my G1 iPod Touch because it's slow and unless you're on a mobile site, it's really hard to navigate through anything. With the iPad, everything moves really quickly, even when I could only get a 1-bar connection. 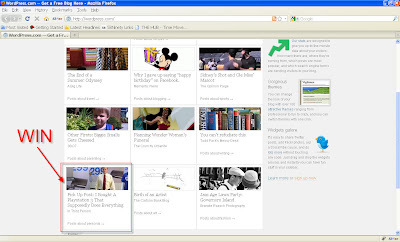 The extra space also makes it easier to surf non-mobile sites, so you can surf the web as you know it with your hands. If you have a lot of iPhone apps and fear that they'll look like crap when expanded to fit on the iPad screen, I have relatively good news for you: they don't look like crap. There's a clear drop in definition, but I don't think it's that big of a deal. iPad-specific applications definitely look better on the big screen, but it's absolutely not a deal-breaker. One thing that has caught me off guard with this device is the great battery life. Even after playing a bunch of games and watching YouTube over the past few days, I have yet to charge it since launch because my battery still has over 50% in the tank. With my iPod Touch, I put the brightness down all the way and turn off wifi whenever I'm not using it to maximize my battery because it seems to run out so quickly. With the iPad at default settings and wifi on all the time, it's still kicking after a number of days of not being charged. While I love having the iPad, I wouldn't go out and throw away your netbook or your laptop in exchange for this. If you're looking for a "real" computer experience, this is definitely not it. Like I said, it essentially has the advantages/disadvantages of a big iPod Touch, so it won't have all of the functionality you may want from a computer at double the price of an entry-level netbook. 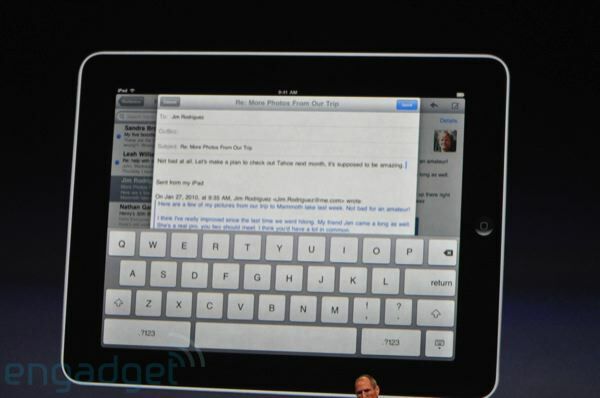 It's worth noting that Steve Jobs is a liar when he said that typing on an iPad was a dream. I eventually got used to typing with my thumbs on my iPod Touch, and this device has a similar learning curve. The big on-screen keyboard initially makes you think you can touch-type on it like you would a real keyboard, but it doesn't work as smooth as you'd hope. You'll frequently hit the wrong buttons and lose your place on the keyboard without the tactile feedback. Using your pointer fingers to start should work fine, though typing up a business document on it could be a nightmare. You can buy the iPad keyboard attachment to alleviate that stress, but at that point, you might as well just buy a real laptop. My only other major gripe is not Flash-related (though not having that is a bummer, too). While the form-factor is great for portability, the tablet style isn't the most ergonomic computing solution. You won't always have it sitting on your lap at the perfect angle to interact with it, so you're either holding it up (which can get tiring) or resting it on a table (which can hurt your neck if it's flat against the table). My girlfriend bought me the official iPad case to go with it, so the cover can be folded back to rest the iPad on an angle, which helps it a bit as far as usability goes. However, for certain applications, such as watching a longer video, you may need to prop it up against something to have it stand upright. 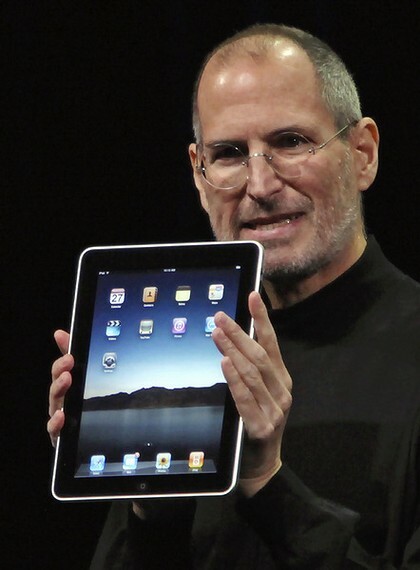 I'm not sure if the iPad will change the world, even though it's sold over 2 million units in the last 59 days. At this point, I'm not even 100% sure where my iPad fits into my own lifestyle, other than as a piece of nerd bling. But I do love using it and I think it has a lot of potential as a computing and media consumption device. If you know what you're getting at the price you're paying and are happy with that, then go right ahead and splurge on an iPad. It's going to take some time before developers, advertisers, content makers and consumers really figure out what this thing can do and how to make the most of it. Till then, I'll chime in on my blog with more impressions on the device, apps, ads and anything else worth noting as I play around with it. I'm not an avid South Park watcher, but some of my favourite episodes are the ones that cover current events and issues. The newest episode of the show, "You Have 0 Friends" is all about how serious Facebook can be. As an avid fan of Facebook humour (and a regular viewer of Lamebook) this episode was right up my alley. 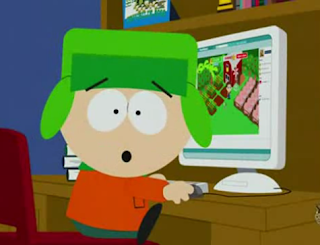 Stan is the guy who is forced into the Facebook world kicking and screaming, Kyle is a Farmville addict who quickly loses friends when he becomes friends with the unpopular kid and Cartman is in classic form. In particular, his segment on Chatroulette may be my favourite part of this particular episode. With the exception of the Tron bits, I think I've seen or experienced all of these scenarios and behaviours since I signed up for the service years ago. I recommend checking it out here if you haven't already seen it. 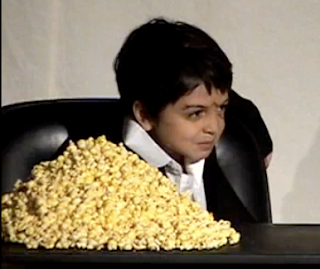 As someone who is a huge fan of the Al Pacino version of Scarface, I'm not sure whether or not this YouTube video of elementary students reenacting Scarface for a school play is horribly disturbing or the best thing ever. In any case, it's probably going to make its rounds as the viral video du jour. Click through to see the video and some of my impressions. This video hit the Internet today care of YouTube user cindymomof6. At face value, the responsible side of me feels really uncomfortable watching this. I have no idea what benefit the kids would get from re-enacting a movie involving gang members, drugs and tons of violence. Even the kids self-censorship makes me feel weird, even though I love fudge. How did any school approve of this? The other side of me thinks that this is freaking hilarious. I've watched it three times over, posted it on my Twitter and Facebook, sent it via IM to a bunch of other people, and am now writing a blog post about it. Is there more going on here? Or is this just the Internet being the Internet? The idea of a kids version of Scarface that was sanctioned by any school just does not compute in my head. Also, this user's favourite videos are all very religious, which kind of contradicts the life and times of Tony Montana. I guess until we learn more about why this video exists, I'll go back to watching Tony Montana go out with a bang. UPDATE: This was not a school play. This was done by director Marc Klasfeld and Rockhard Films, whose credits include Lady Gaga's "Pokerface" and Adam Lambert's "For Your Entertainment. Thanks to TMZ for cracking that case pretty quick! Leaders of the New is an ongoing feature on jettlandicho.com that will spotlight the future talents of advertising. Click here to check out the Leaders of the New Facebook group. In Third Person is my gaming website. Click here to check it out.